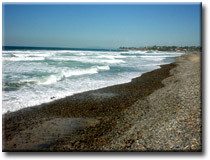 San Elijo State Beach offers swimming, surfing and picnicking. The narrow, bluff-backed stretch of sand has a nearby reef popular with snorkelers and divers. The entrance to the campground will be on your left, but you cannot turn left into the campground. Instead, go just past the entrance 300 yards where there is a left turn lane for turning into Day Use Parking, and U-Turn to come back to the main entrance. Reservations required. Call 619-793-5091. Online reservations can be made here. Campground closed February and March. Fees include entry for 1 vehicle and 1 legally towed vehicle or trailer, additonal vehicles will be charged per night at the park. Campers under the age of 18 must be accompanied by a parent, or provide a letter from a parent granting permission to camp. All juveniles must be in their own campsite after 10 PM. Quiet hours are 10 PM - 6 AM. Visitors not staying overnight must be out by 10 PM. Generator hours are from 10 AM - 8 PM. Campsite is limited to 8 people maximum. RV hookup sites are limited to 2 vehicles, and all wheels must stay on pavement. Standard sites allow 3 vehicles. There is no parking for more vehicles. A trailer is counted as a vehicle. Animals must be on a leash less than 6 feet at all times. They may not be left outside at night. Alcohol and glass containers are NOT allowed on the beach or beyond your campsite. All park plants are protected. Do not cut or attach items, such as ropes, to any plants. Campsite assignment is by random drawing at 9 AM during summer season and holidays. Maximum stay during High Season (June - September) is 7 nights. All persons and equipment must vacate for a minimum of 48 hours before beginning another stay. Premium Oceanfront sites available. Oceanfront sites are on a bluff overlooking beach and have no shade. 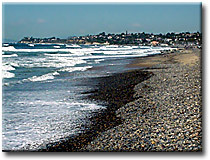 Located on the San Diego Coast, which has been called the Riviera of the West, Cardiff State Beach has a gently sloping sandy beach with warm water.